Sorry for the long hiatus. Sometimes, in spite of a firm commitment to piracy, the World just gets in the way. I’ve read Treasure Island several times, and have been on a years’ long quest to see as many different movie versions as possible. Four or five years ago, I refreshed my direct knowledge of the novel by listening to on CD over several days during my morning commute. A good reader can add a lot to the listener’s understanding of a book, and after a week or so of commuter-listening, I felt that I had a good, deep grasp of what Robert Lewis Stevenson was trying to say. But I was also aware of just how hard some of the vocabulary is. I’ve been reading about pirates, and ships, for over ten years, and I’ve been reading history for thirty. In addition, I have the skill of picking up vocabulary in context. I’m not sure this is taught in schools anymore. But between old-fashioned words, pirate slang, and poor grammar, accurately recorded, there was ample opportunity for some people to struggle with this book. For a long time, I had a desire to create an annotated version. All the words or concepts that folks might not “get” would be explained in sidebars. The book would be more readable to all the people who might enjoy it. One problem stood in my way – no digital copy of the book’s contents that could be converted to Word.. Sure, I could have typed it all out from one of my several hard copies. But if you folks haven’t noticed yet, I’m not an especially good typist. Finally, a friend with better computer skills helped me out. (Hi, Katherine!) At last, the annotated Treasure Island could become a reality. Looking up words, reading up on the English Justice System, and generally keeping my nose to the grindstone to make this edition happen has taken an incredible amount of time. The job became consuming. How do you fire one of those old pistols? What are the parts of the ship? And what about the song, “Yo ho ho and a Bottle of Rum?” So many things needed to be included. I lost sleep, unable to go to bed with the project incomplete. Then there was the proof-reading, the beta reader, (Hi, Jeff!) the re-proof reading, the formatting issues and the search for cover artwork. Finally, though a book emerged that I could be proud of. It went out to the printer, and copies are now availableon Amazon. It’s also interesting to compare the book to the movies. In the novel, Dr. Livesey is quite hard on Jim for having run off to spy on the pirates. Never mind that Jim is only about 13 years old, and he had the best intentions. In spite of saving them all, Jim has to face some hard words from his companions. Most movies leave that out, but it says a lot about what was expected of “Englishmen” back in the day. One thing that the movies and the book have in common. 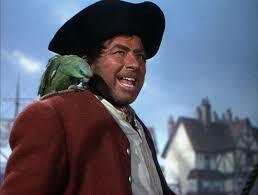 At the end, Long John Silver is still at large. This, I think, is the thing that makes the book a classic. We can still dream of running off with the famous pirate. Treasure Island has defined the image of pirates for generations. If you haven’t read the book, you should. 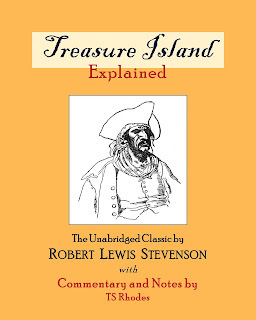 Check out a copy from your local library, or maybe pick up a copy of Treasure Island Explained. You’ll be glad you did.